Experience freedom from the pit and victory in Christ! Have you ever found yourself in a pit… a deep, dark place in life where you feel lonely, depressed, and defeated? Have you ever longed for deliverance but secretly doubted it would ever come? In this powerful, hope-filled series, Pastor Jeff Schreve explains how you can go from the lowest depths to the most miraculous deliverance by the power of God. 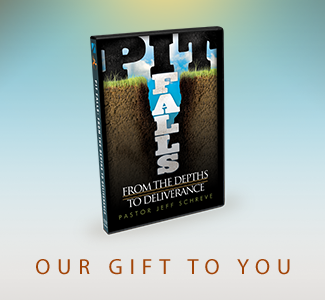 This message series, Pitfalls: From the Depths to Deliverance, is our gift to say thanks for your support this month. Thank you for your gift this month to help us reach out to the world with the life-changing hope found only in Jesus. This audio series is available on CD, DVD, USB flash drive, or MP3 download. Requests from outside the USA receive the immediate MP3 download format. Click here first. I'd like to add 2% to help cover FHH's credit card processing fees. I'd like to give automatically each month and become a Vision Partner. Yes! Please send me the weekly Real Hope Email Encouragement devotional every Friday morning. The security and confidentiality of your information is our highest priority. We use industry-standard SSL (secure socket layer) technology to protect your information and provide a safe and secure environment for online donations. We will not sell, trade or share your personal information with anyone else, nor send donor mailings on behalf of other organizations. Never! Period! A donation receipt will be sent to you at the email address you provide on this form. Please be sure to keep a copy of your receipt for tax purposes. If you become a Vision Partner by choosing to select a recurring monthly donation option, you will be sent an individual receipt each month when your donation is processed. What if I get a Credit Card error message? There are many possible reasons why an error message is displayed. We hope you'll give us a chance to help you by calling 877-777-6171 and allow us to handle your request personally. Call anytime 24/7. I submitted my donation, but made an error. Is it too late to make a change? Absolutely not! Just email us by clicking here and submit your request for a change and we'll get right on it. Or you can call our Texarkana, Texas home office Monday - Thursday from 9:30 am to 3:30 pm central time at 903-838-8329. We'll be happy to correct any error or refund your donation. Where can I submit a question or comment? Right here. We'll respond promptly when you email us.